AARP recently released their “Healthiest Hometowns” list. Did YOUR city make the cut? Look for these and many other places to be search able on www.seniorlivingguide.com soon! Almost 18% of American adults are now retired, medical Internet usage expected to grow. August 10, purchase 2008 – The status and demographics of retirees are changing so fast that marketers almost need a monthly snap shot. In the U.S., 17.9% of adults are now retired, according a recent report by The Media Audit. But, that number has increased by 6% in just the last five years. It will climb even faster as the Baby Boomers exit the workforce. The Media Audit says these adults, who are nearing retirement, are now one of the fastest growing demographics in the country and this horde of Boomers will keep the retirement boom going for the next few decades.Consumption habits of aging Americans are likely very different from those of their predecessors because they are living longer, achieving higher levels of education, are wealthier, and redefining what it means to be retired. Retired adults today spend only 89 minutes per day online, a figure that is 26% less than the average U.S. adult who spends 123 minutes per day online. The next generation of retirees, though, is expected to be more computer and internet friendly, since Baby Boomers between the ages of 45 and 64 spend a considerably higher amount of time online – 123 minutes per day. Seniors Now Have a Voice! www.seniorlivingguide.com has added a message board for seniors and their loved ones to discuss issues important to them! You can visit us here. We look forward to reading your thoughts! Comments Off on Seniors Now Have a Voice! New Markets And Growth For Our Website! www.seniorlivingguide.com has added new markets to their website now offering content in nearly 20 states! These new listings comprise senior housing facilities operated by Century Park Associates. We’re busy getting all of their information, pictures and floor plans up but this is a great sign of great things to come. www.seniorlivingguide.com is growing from the nations premier source of senior housing information into the nations LARGEST source of senior housing information. Comments Off on New Markets And Growth For Our Website! Senior Living Guide’s Scoop Newsletter is another free service provided to industry professionals by the publishers of Senior Living Guide. The Scoop is a monthly electronic email newsletter distributed to more than 2,500 subscribers. The Scoop brings subscribers all the up-to-date senior industry news, information and resources currently happening in each region. The Scoop is provided in the Midlands, SC; Upstate, SC; Charlotte, NC; Triangle, NC; Florida and Virginia regions. Anyone is welcome to submit information* for the newsletter. Submissions range from Career Opportunities, Calendar of Events, Educational Events, Announcements, Celebrations, Fundraisers, Photos, etc. Sponsorship opportunities are also available with a free link to the sponsor’s web page. The Calendar of Events is linked to the Google Calendar which can be easily printed by the subscriber in an “agenda” format. Send us an email at info@seniorlivingguide.com the next time you need to get the word out or if you would like to receive your FREE Scoop! School kids aren’t the only ones hitting the playground these days! 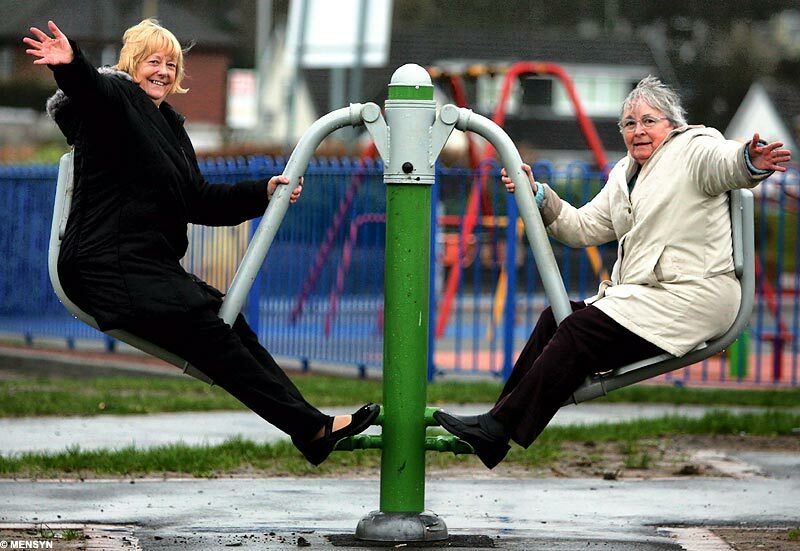 Across the pond SENIORS are taking to the park for some physical fun. The playground, located in Manchester, is designed for the over 60 adventurer and focuses on gentle exercises for different parts of the body such as hips, legs and torso. Could this be a trend we’ll see here in the states? Comments Off on Recess for Retirement! Senior Living Guide and www.seniorlivingguide.com are the nation’s leading resources for senior housing options and senior services. We offer online and print directories of Assisted living Facilities, Retirement Communities, Alzheimer’s & Dementia Care, Nursing and Rehabilitation Centers, Active Adult Communities and Senior Related Support Services. Our free publications are distributed in Florida, South Carolina, North Carolina and Virginia, and our online content contains information on senior housing communities nationwide. www.seniorlivingguide.com offers information to care givers loved ones and seniors themselves and contains information consumers need to know including floor plans, pictures, amenities and pricing. www.seniorlivingguide.com and Senior Living Guide magazine – the nations premier senior housing resource.